It’s a city of lights, which never sleeps specially when it comes to food. Rich in culture, people and shopping places. I really like because of very cheap and good foods and the best hospitality of Karachi people's. Karachi is city of lights.Here you can have a meal in 10usd cents and in 100usd. Shopping,Malls,Cinemas,Beaches,Late night restaurants.Here you can leave a restaurant at 3 am in the morning. Eat out is the best entertainment here.Also Karachi is one of the largest city in the world.You will huge houses which are wow. Here you can get all world brands and non brands. ci sono andato perchè ci abitano i miei nonni mi diverto tantissimo con i miei cugini. The Baloch tribes from Balochistan and Makran established a small settlement of fishing communities, many of whom still inhabit sections of Sindh, and called it Kolachi. The modern port-city of Karachi, however, was developed by authorities of the British Raj in the 19th century. Upon the independence of Pakistan in 1947, the city was selected to become the national capital, and was settled by Muslim refugees from India, which radically expanded the city's population and transformed the demographics and economy. Karachi has faced major infrastructural and socio-economic challenges, but modern industries and businesses have developed in the city, and the population expanded even after the capital was moved to Islamabad in August 1960. The area of Karachi has been known to the ancient Greeks by many names: Krokola, the place where Alexander the Great camped to prepare a fleet for Babylonia after his campaign in the Indus valley; 'Morontobara' port (probably the modern Manora Island near the Karachi harbour), from where Alexander's admiral Nearchus sailed for back home; and Barbarikon, a sea port of the Indo-Greek Bactrian kingdom. It was also known as the port of Debal to the Arabs, from where Muhammad bin Qasim led his conquering force into South Asia in 712 AD. According to the British historian Eliot, parts of city of Karachi and the island of Manora constituted the city of Debal. The present city started its life as a fishing settlement where a Sindhi fisherwoman by the name of Mai Kolachi took up residence and started a family. The village that later grew out of this settlement was known as Kolachi-jo-Goth (The Village of Kolachi in Sindhi). By the late 1700s this village started trading across the sea with Muscat and the Persian Gulf region which led to its gaining importance. A small fort was constructed for its protection, armed with cannons imported from Muscat. The fort had two main gateways: one facing the sea, known as Khara Darwaaza (Brackish Gate) and the other facing the adjoining Lyari river known as the Meetha Darwaaza (Sweet Gate). The location of these gates corresponds to the present-day city localities of Khaaradar (Khārā Dar) and Meethadar (Mīṭhā Dar) respectively. In 1795, the village became a domain of the Balochi Talpur rulers of Sindh. A small factory was opened by the British in September 1799, but was closed down within a year. After sending a couple of exploratory missions to the area, the British East India Company conquered the town on February 3, 1839. The village was later annexed to the British Indian Empire when the province of Sindh was conquered by Charles Napier in 1843. Kolachi was added along with the rest of Sindh to the jurisdiction of the Bombay Presidency. The British realized its importance as a military cantonment and a port for exporting the produce of the Indus basin, and rapidly developed its harbour for shipping. The foundations of a city municipal government were laid down and infrastructure development was undertaken. New businesses started opening up and the population of the town started rising rapidly. Karachi quickly turned into a city, making true the famous quote by Napier who is known to have said: Would that I could come again to see you in your grandeur! In 1857, the First Indian War for Independence broke out in the subcontinent and the 21st Native Infantry stationed in Karachi declared allegiance to revolters, joining their cause on September 10, 1857. However, the British were rapidly able to reassert their control over Karachi and defeat the uprising. Karachi was known as Khurachee Scinde (i.e. Karachi, Sindh) during the early British colonial rule. In 1864, the first telegraphic message was sent from India to England when a direct telegraph connection was laid down between Karachi and London. In 1878, the city was connected to the rest of British India by railway line. Public building projects such as the Frere Hall (1865) and the Empress Market (1890) were undertaken. In 1876, Muhammad Ali Jinnah, the founder of Pakistan, was born in the city, which by now had become a bustling city with railway, churches, mosques, courthouses, markets, paved streets and a magnificent harbour. By 1899 Karachi had become the largest wheat exporting port in the east (Feldman 1970:57). The population of the city had also risen to about 105,000 inhabitants by the end of the 19th century and was a cosmopolitan mix of Hindus and Muslims, European traders, Jews, Parsis, Iranians, Lebanese, and Goan merchants. By the turn of the century, the city faced street congestion, which led to India’s first tramway system being laid down in 1900. By 1914, Karachi had become the largest grain exporting port of the British Empire. In 1924, an aerodrome was built and Karachi became the main airport of entry into India. An airship mast was also built in Karachi in 1927 as part of the Imperial Airship Communications scheme, which was later abandoned. In 1936, Sindh was separated from the Bombay Presidency and Karachi was made the capital of the new province. 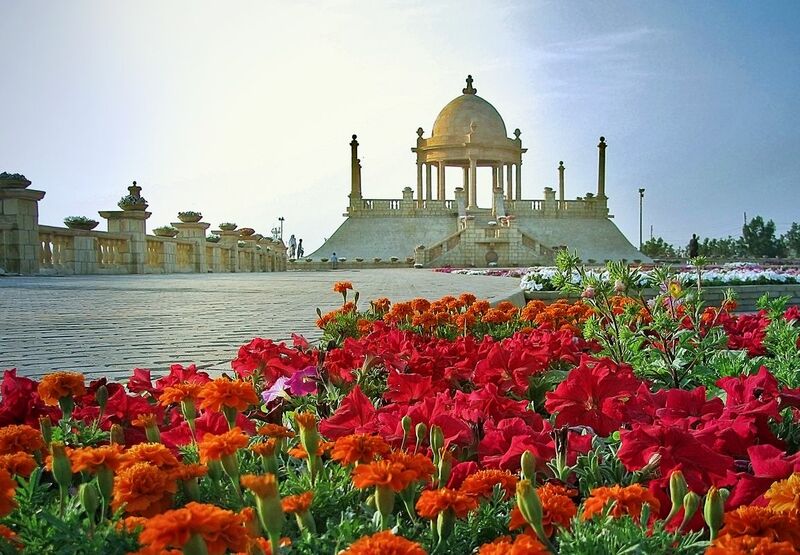 By the time the new country of Pakistan was formed in 1947, Karachi had become a bustling metropolitan city with beautiful classical and colonial European styled buildings lining the city’s thoroughfares. Karachi was chosen as the capital city of Pakistan and accommodated a huge influx of migrants and refugees to the newly formed country. The demographics of the city also changed drastically. However, it still maintained a great cultural diversity as its new inhabitants arrived from all parts of the subcontinent. In 1958, the capital of Pakistan was shifted from Karachi to Rawalpindi and then to Islamabad in 1960. This marked the start of a long period of decline in the city, owing to a lack of governmental attention and development. The 1980s and 1990s saw an influx of refugees from the Afghan war into Karachi. Political tensions between the Mohajir groups (descendants of migrants from the partition era) and other groups also erupted and the city was wracked with political and sectarian violence. Most of these tensions have now simmered down. Karachi continues to be an important financial and industrial centre for the country and handles most of the overseas trade of Pakistan and the central Asian countries. It accounts for a large portion of the GDP of Pakistan and a large chunk of the country's white collar workers. Karachi's population has continued to grow and is estimated to have passed the 20 million mark, although official figures still show a population of around 14.5 million. The current economic boom in Pakistan has also resulted in a new period of resurgence in the economy of Karachi.